This wonderfully exuberant calligraphic drawing dates from 1959 and is part of a group of works discovered only recently at the artist’s Camden Square home. 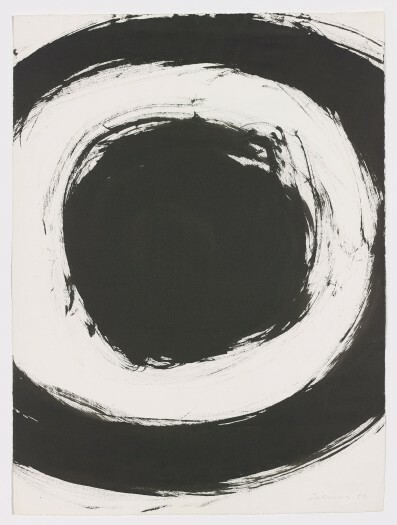 These dramatic and appealing works on paper show Turnbull exploring a range of gestural marks, which inform his paintings from the same period. Turnbull’s works on paper give an invaluable insight into his thought processes. His key motifs – the human head, walking and standing figures, calligraphic mark making – recur throughout his career and in many forms. His works on paper are diverse in both process and media, and they include works in crayon, charcoal, gouache, watercolour and oil on paper, unique monoprints, symmetrical prints folded though the centre, silkscreen prints and lithographs. The circular motif in Untitled, 1959, is derived from Turnbull’s earlier paintings and drawings of heads from the mid-1950s, in which the human head was built up from a series of calligraphic marks, and which were later translated into bronze reliefs. Here, the central ‘head’ motif is enclosed by another circle, in other drawings from this sequence the circle progresses out to the edges of the paper, so that only part of this motif is showing. We see this notion of a section of a circle developed in Turnbull’s oil paintings from the period, 15-1959 (coll. National Galleries of Scotland), for example, features a perfect circle of dark red on light red, the following year 12-1960, we find a curved section painted in the same two colours. These drawings are highly reminiscent of an ensō (Japanese for ‘circle’), one of the most important symbols in Zen Buddhism. The action of making such a drawing, which should be made in one or two brushstrokes, is a meditative practice denoting a single moment of creative expression. This ensō symbol should be reflected upon and has numerous associations including as a symbol of enlightenment, infinity and strength. It also presents a number of dualities - fullness and emptiness, perfection and imperfection, movement and stillness – within a single form, qualities which Turnbull was seeking to achieve in his own practice. In 1960 William Turnbull married the Singaporean sculptor Kim Lim. In 1962 they travelled to Japan, Cambodia, Malaysia and Singapore, a significant experience which invigorated Turnbull’s work and deepened his understanding of Southeast Asian art and culture.